GENEVA, Feb. 26 (Xinhua) -- China attaches great importance to undertakings for persons with disabilities, and will not leave behind a single one of them while building a moderately prosperous society, a senior Chinese diplomat said at the UN Human Rights Council (UNHRC) session in Geneva on Tuesday. For the first time within the UNHRC framework, China and the European Union co-hosted a meeting, titled "Leave no one behind: the key role of the Convention on the rights of persons with disabilities," at the UN Office at Geneva (UNOG) on Tuesday, on the sidelines of the ongoing UNHRC's 40th session. 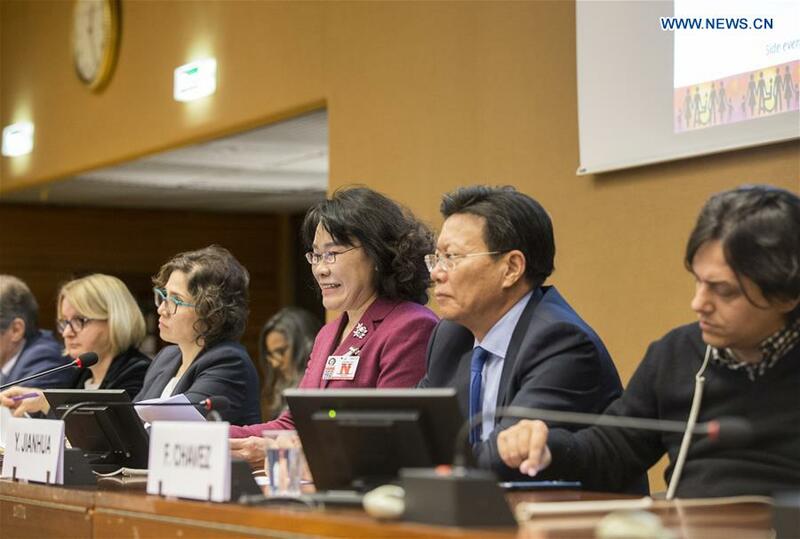 Yu Jianhua, head of the Chinese mission to UNOG, said at the meeting that safeguarding the rights of persons with disabilities has become a general consensus of the international community, and the Chinese government has attached great importance to undertakings for them. "China will have eliminated absolute poverty by 2020, when the 85 million people with disabilities in the country, together with the rest Chinese, will see the coming of a well-off society," Yu said, emphasizing that no one is to be left behind. The Chinese envoy underlined that the meeting is of great significance for China and Europe to strengthen exchanges and cooperation in the field of human rights. Faced with rising unilateralism and anti-globalization sentiments across the globe, China and the European Union (EU) "should strengthen dialogue and cooperation, jointly promote and practice multilateralism, and safeguard the international order and system based on the United Nations framework, so as to join hands in addressing global challenges," Yu said. "China is willing to work with the EU to promote the UN Human Rights Council as a bridge across different civilizations and a platform for exchanging human rights protection experience," he said. Ambassador Walter Stevens, head of the EU delegation to UNOG, said that China and the EU, as two of the world's major economies, both have a long and splendid civilization and are facing many global challenges. The EU is willing to strengthen exchanges and cooperation with China in areas including those of promoting undertakings for persons with disabilities worldwide. Also at the meeting, Zhang Haidi, chairperson of China Disabled Persons' Federation and president of Rehabilitation International, expounded on the undertakings for persons with disabilities in China, including the measures and achievements in promoting their social security, poverty alleviation, rehabilitation, education and employment in recent years. Speaking highly of the achievements, participants at the meeting, including representatives from more than 40 countries, international organizations and non-governmental organizations, agreed that China's experience in promoting the undertakings for persons with disabilities has set a valuable example. They hope the Chinese wisdom could continue to be shared with the rest of the world.